As you become absorbed in amateur astronomy, you may stop to wonder how others developed an interest in this hobby. Amateur astronomy is truly nothing new. The technology has changed, the number of people involved has changed, however, the same basic desire has remained the same. A curiosity of what’s up in the night sky. While you may use a sophisticated computerized telescope with the finest of eyepieces, the earlier amateurs used both crude lenses and telescopes, sometimes made by themselves. 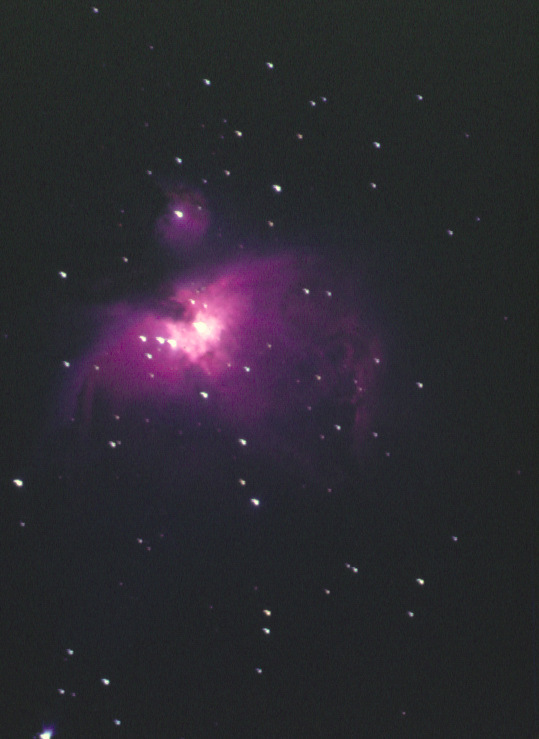 Some did it for science, while others did it simply for pleasure and “for the love of.” Within our own American history of amateur astronomy is an unusual, but sad story of one amateur; not unlike many of us in one way, however, far different in others. He left a legacy almost despite himself. This is the story of that amateur which has been told to me by some of his acquaintances of days past. In 1992, I read the following from “1000+ The Amateur Astronomer’s Field Guide to Deep-Sky Observing” P-81, by North Carolina amateur and author, Tom Lorenzin. I became very interested in the story and wanted to learn more. Elliptical galaxy NGC 404 could easily be mistaken for a comet, especially if it was unknown to the observer, prior to an observation. This magnitude 8 galaxy is nestled in the glow of the much brighter star, BETA Andromeda. I have observed this galaxy many times over the years and have found it to be fairly easy to see with telescopes as small as an 80 mm refractor. When observing NGC 404 on those cooler nights of fall, I always think about the excitement Ted Komorowski must have felt when thinking he had discovered a new comet. Gayle Riggsbee of Charlotte had known Ted for many years and talked with him only days before his untimely death in 1969. Gayle was a mechanical engineer and helped Ted with his many astronomy projects. On many afternoons, when returning home from work, Gayle would find Ted sitting on his steps…he might need some penny’s converted into copper washers, or any number of things. Ted didn’t have a job, and had very little money, so he was forced to improvise on his projects. Ken Dwight of Houston, lived in the same Charlotte neighborhood as Komorowski from the early 50’s until 1968. Ken knew Ted very well and was impressed with his skills and abilities as an amateur astronomer. Robert White became acquainted with Komorowski when he was only twelve years old, and had many discussions with him concerning astronomy and telescopes. Ted really liked to share his knowledge of amateur astronomy with others. He was a member of the Charlotte Amateur Astronomers Club for several years. The Charlotte Amateur Astronomers Club has really grown since the days of Ted Komorowski, with a current membership of a hundred or more, and a club observatory. They also sponsor the nationally renowned and celebrated Southern Star Astronomy Convention in the mountains of North Carolina, near Little Switzerland. Gayle Riggsbee and Robert White are still members of the club. Ted Komorowski could be considered an advanced amateur for many reasons. During the early sixties, most amateurs were using small telescopes and fortunate indeed was one who had a 6-inch reflector. Ted’s 12.5-inch f/6.5 Criterion reflector was the largest telescope in the Charlotte area during the early 60’s. He was one of the first astrophotographers in the region and also documented his observations. He built his own drive corrector based on an article he had read in Sky & Telescope Magazine. His photo efforts at times were very frustrating, but he still fantasized about selling his slides to planetariums throughout the country. Ted apparently corresponded regularly with Walter Scott Houston who was a contributor to Sky & Telescope Magazine for more than 47 years, writing the Deep-Sky Wonders column. Ted took amateur astronomy very seriously. He also wrote quite a few letters to the editors of Sky & Telescope Magazine, concerning everything from meteor showers to a review and comparison of planetary nebulae. The following letters and writings are from the Sky & Telescope DVD collection. On page 85 of the February issue, C.R. O’Dell points out the desirability of special amateur observations of central stars in planetary nebula, to check on possible brightness changes. He gives a list of the five planetaries having the brightest central stars. I feel that NGC 2392 in Gemini and NGC 3132 in Antlia should be added, since visually I find that their central stars seem at least as bright as that in NGC 6826, which Dr. O’Dell lists. Sky & telescope, February 1962, p. 4-5 “Leonids Meteors Give Unexpected Display” This was a very lengthy letter and the following is only the first paragraph. Komorowski lived with his parents, except for a brief period when he went away to college. He did not have a drivers license until a year or possibly two, prior to his death, and he never owned a car. His mode of transportation was a bicycle. On occasion he would ask others for a ride, however, Ted had very few friends. From all accounts, it would appear that Ted had some social skill issues, at times having difficulty relating to others. Ted earned a scholarship to Carnegie Institute of Technology in Pittsburgh, Pennsylvania. He studied nuclear physics, but attended for only a year, possibly two. He then returned back home where he felt the most comfortable. Ted had a desire and ambition of becoming a planetarium lecturer. A year or two before his death, Ted did get a job, delivering milk, going door to door, during the very early morning hours. This might have been the perfect job for Ted, as he worked mostly by himself, and it allowed him the opportunity to observe every clear night, if he so desired. It has been alleged that Ted’s girlfriend was planning on severing her relationship with him. She was concerned that Ted might become violent when she delivered the bad news, and secured a small handgun for self-defense. Allegedly, after the breakup, she felt threatened during a confrontation and fired a single shot, hitting Ted in the chest, killing him instantly. After his passing, Ted’s father asked fellow club member, Gayle Riggsbee if he would select some of his best slides and give to the Charlotte Nature Museum as a memorial. The telescope was ordered from Criterion as an optical tube assembly only, but without the mirrors. Ted, however, ordered the mirrors from the Optical Craftsman, who guaranteed his criteria for a 1/20 wave accuracy. From all who have had the opportunity to observe through this scope, it has been reported to be an excellent mirror indeed. The mirror is dated 12-2-60, which might indicate that the telescope was possibly received in 1961. He replaced the standard four-vane spider with a custom made circular spider to eliminate spikes during astrophotography. This was an advanced feature in the early 60’s. Teds favorite eyepiece was the Criterion 16.3 mm Erfle eyepiece with a very wide 75 degree apparent field. He also had the 4 and 6 mm Criterion orthoscopic eyepieces. The focal length of the 12.5-inch f/6.5 scope is 2064, which would have given a magnification of 126x when using the 16.3 mm eyepiece. The 16.3 mm Erfle would most likely have been his eyepiece of choice when observing deep-sky objects. Could this have been the eyepiece that he employed when he saw the smudge in the glare of Beta Andromeda? The 12.5-inch Criterion telescope is really big, with the tube being slightly over 6 1/2 feet in length. Unfortunately, Ted could not afford to purchase the proper mount, but instead used the mount from his previous 8-inch Criterion scope, which was a bit too small. The Komorowski telescope is now owned by the Cleveland County Astronomical Society. It is maintained and stored in the Williams Observatory, on campus of Gardner-Webb University in Boiling Springs, North Carolina. The telescope has been completely restored by Steve Davis and John Elmore of the Cleveland County Astronomical Society. This is a beautiful scope in pristine condition. 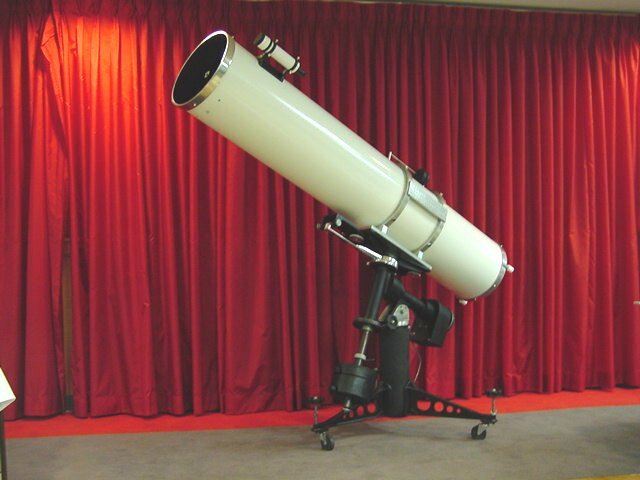 The original Criterion mount has now been replaced by a much more heavy duty mount, manufactured by Meade Instruments Corporation, and designed for a 16-inch, model DS-16A reflector. Ted observed from his backyard in Charlotte. The mount was “at times” left outside and covered when not in use. The OTA was stored in Ted’s living room, sitting on the mirror end in a corner. However, Ken Dwight remembers seeing the scope on many occasions mounted in the side yard, covered with a tarp. To a casual spectator, the heavens on a clear night present a vast, featureless jumble of myriads of specks of light, with a few brighter beacons. But to someone who has taken the time to become acquainted with his heavenly friends, the sky is made up of orderly patterns and shapes, while bright or important stars and all the planets become celestial landmarks leading to the more difficult objects. Some knowledge of the constellations gives one a 24-hour clock, a compass, and a protractor, but there are also philosophical aesthetic, and scientific reasons for stargazing. Stars are lovely to behold, forming attractive celestial patterns, and some who even have a shade of color. Scientists can study the stars to learn about matter under conditions unobtainable in earthly laboratories. An even greater knowledge of our own world and its beginning and its eventual ending can be gotten from observing stars in different ways. Star names and their derivations indicate something of the contributions to astronomy of ancient and fallen civilizations, and celestial mythology is a storehouse of early folklore. The legends of Perseus, Andromeda, and Orion are well established in the sky for ages to come. The planets, too, have their store of myths. Mars, named after the Roman god of war because of its angry red countenance, is really not as harsh as its name implies, for it is the least hostile to life of all the other planets. Men who spend their lives trying to figure out the scheme of things and find the meaning in the universe, men who are seeking answers to very difficult questions, are greatly aided and guided by knowing what is happening above. Reverent people may feel closer to the Creator after they have acquired a knowledge of his creations. Others may gain their first religious awareness from experiencing the wonder, awe, and mystery of the firmament. I would like to thank Gayle Riggsbee of Charlotte, and Ken Dwight of Houston, without them and their memories, this story would have gone untold. Thanks to Tom English for his research using the S&T magazine DVD collection to gather all of the magazine quotes and letters. A special thanks to Sky & Telescope Magazine for giving me permission to use the information and letters provided to the editors by Ted Komorowski, also quotes by Walter Scott Houston from Deep-Sky Wonders. This entry was posted on January 11, 2013 at 2:06 am and is filed under Roger's Articles. You can subscribe via RSS 2.0 feed to this post's comments. Both comments and pings are currently closed.